Extraordinary Ministers Of Holy Communion At Mass (EMHC) prayerfully serve the faithful people of Saint Patrick Catholic Church by distributing the Precious Body and Blood of Christ during the Eucharistic celebrations of the Mass. 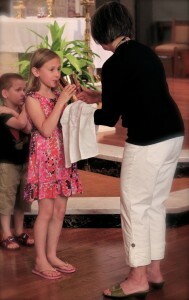 What are the Responsibilities of a Extraordinary Ministers Of Holy Communion At Mass? What is Required To Serve as a Extraordinary Ministers Of Holy Communion At Mass? In this ministry you are asked to serve once or twice a month. A monthly schedule is emailed to all Extraordinary Ministers Of Holy Communion. EMHC training is provided by the EMHC trainer, about 2-3 times a year, generally in preparation for the holiest times of the liturgical year— Christmas and Easter or when there is a need. Holy Thursday | April 18 | 7:00 P.M.
Easter Vigil Mass | April 20 | 8:30 P.M.